When shall private messages be available? ameo Has this been confirmed as a default extension? Allineer that doesn't say a lot now does it. Anyways, your best bet is to wait. Berlyn Has this been confirmed as a default extension? I don't think it should be one by default. 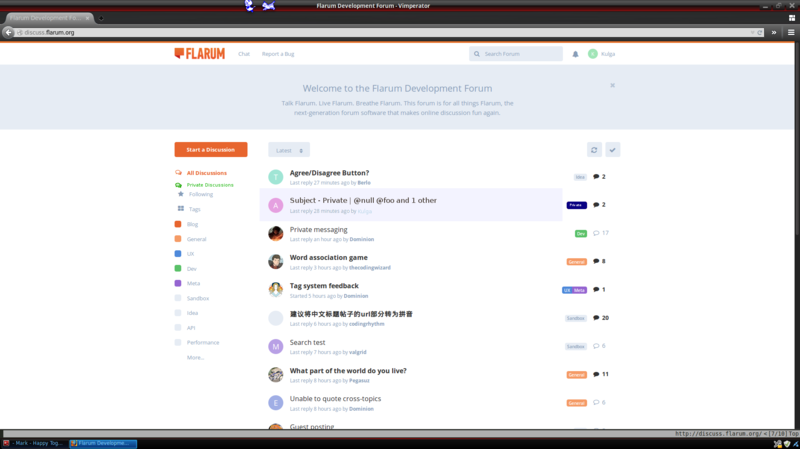 I feel like Flarum should only contain core features such as threads, posting, and what not. Everything else like PM's, Captchas, Followers/Following, Subscribing to topics and such should be extensions Unless there's a way to integrate Flarum (if it ends up having PM by default) with an already existing Private Messaging system. I think this message from @Toby is a good outline of the differences between core, default extensions and 3rd party extensions. I will be doing this as an extension. Not yet. We'll be working on a "Private Discussions" extension after beta. I think some users might find a "private messages" (as opposed to "private discussions") extension quite useful. Private messaging and private discussions serve the same purpose since (as least in esotalk) a private discussion can involve just 2 people. However, you don't want a private message to disappear below the flow of other public discussions. Why not integrate it with a Private Discussions below All Discussions? When you click on it, it filters out everything else. Starting a private discussion should be easy too, like click on a user and choose "start a private discussion" with option to include others. Kulga I love the idea, but I think it would be suited to an invite system, that way you allow 1 to 1 messaging or group related chat, similar to that of Facebook groups. Kulga Private messaging and private discussions serve the same purpose since (as least in esotalk) a private discussion can involve just 2 people. The main distinction between private messaging and private discussions is structural rather than functional. Private messages, by contrast, are not discussions. They don't need to involve the tagging system, because they take place in a different sort of space. I'd prefer a private messaging system to a private discussions system because I think the latter adds a bit of unnecessary complexity for the end user. Berlyn I love the idea, but I think it would be suited to an invite system, that way you allow 1 to 1 messaging or group related chat, similar to that of Facebook groups. Kulga It is strange that no one has ever made private messages for all time. 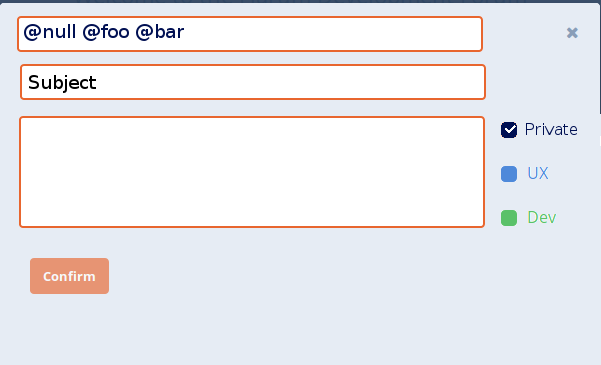 Berlyn Group chats would be good, I may also do that by using the Pusher extension for real-time chat. I'd prefer a private messaging system to a private discussions system because I think the latter adds a bit of unnecessary complexity for the end user. To start a 1-1 discussion, you should be able to start just as you would a private message. But keeping it a specialized form of discussion would easily permit adding users - just invite them in - as Berlyn mentioned. 1-n is much more flexible then 1-1. Just because for most them n == 1 shouldn't matter. This seems like a incredibly valuable feature. Permissions are a null point. There should be no permissions beyond is this user a invited person of this discussion If they are, they see the whole discussion. Any other behavior should be a bug. Private messaging and private discussions feels redundant, and I feel like private discussions can do private messaging as simply as a pm system would, with the ability to do more. In fact, it should feel identical to a pm until you need it to do more. Also, I definitely think private discussions (or pm's) should be colored differently to identify them as private. that's great.... for someone, but not me. I am sure I will only be using the official extensions, and even out of those, the only one using a third party will be Google login. I try to keep away from using services out of my control. Kulga To start a 1-1 discussion, you should be able to start just as you would a private message. esoTalk does allow users to start a private conversation by clicking a link on the profile page of the person. The next thing you see, however, is the channel selection page (because in esoTalk, you can't have a conversation that isn't in some channel or another). That's where "private conversations" become more complex than "private messaging". If it were a private message system, we would be able to skip the channel selection and just start entering the message (and its title, of course). Kulga Permissions are a null point. There should be no permissions beyond is this user a invited person of this discussion If they are, they see the whole discussion. I agree this would make sense. But it does raise certain issues. For example, exactly where would the discussion be displayed? If I invite you to participate in a private discussion tagged with the "Experimental" tag, and you don't have permission to access that tag, then you won't be able to see that tag or select it in your sidebar. You would have no choice but to scroll down the "All Discussions" list until you found the discussion in question. Kulga Tags.. I'm not sure about. Your idea of a private tag sounds good, but I'd permit other tags to be added on since larger private discussions could use them. I'm divided about this too. Generally speaking, I don't see much of a need to put tags on private discussions, since tags are mainly a way to categorize information that can be accessed by a large group of people (such as a forum). When the discussion is limited to a smaller group of people, such categorization becomes much less important. On the other hand, I run a forum that uses private discussions quite heavily ... and when you've got a lot of private discussions going, it can be nice to have some way to categorize them. 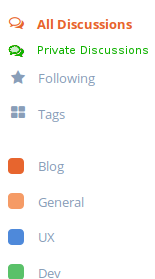 So I guess on the whole, I'd probably agree that the allowing tags other than "Private" would be a good idea. At any rate, my "Private" tag idea was only intended to demonstrate how a "private discussion" system (which is to say, a system that leverages existing discussion functionality) could be constrained to act more like a "private messaging" system, allowing the devs (and users) to sidestep the issues raised by tags and permissions. From that perspective, the above considerations are more or less moot. Don't get me wrong, I'm not saying that both should be made available. My point was that they are quite different solutions to the problem of providing for private communication, and one or the other may be a better choice under certain circumstances. I don't see any point in discouraging third-party developers who are thinking about providing alternatives to default extensions. Kulga I feel like private discussions can do private messaging as simply as a pm system would, with the ability to do more. In fact, it should feel identical to a pm until you need it to do more. I disagree. Yes, private discussions can do more; but it would be quite difficult to make them as simple as a private messaging system (from the end user's point of view) for the simple reason that you have to take into account things like tags and permissions. With a private messaging system, there's no need for either. Kulga Also, I definitely think private discussions (or pm's) should be colored differently to identify them as private. That's a very good idea. I've often felt the purple envelope icon in esoTalk is a bit understated for what it needs to do. It should be optional and not a criteria of creating the private discussion. It should (I suppose) default to Private and move immediately to the discussion part. Maybe after creating it, have the ability to categorize it. The title part reminds me of The subject, which almost pm systems (i'm aware of) have. For example, exactly where would the discussion be displayed? If I invite you to participate in a private discussion tagged with the "Experimental" tag, and you don't have permission to access that tag, then you won't be able to see that tag or select it in your sidebar. A very good point. I wouldn't be in favor of it appearing for just that discussion. In this case, it would not benefit the person who did not have permissions for it in the first place. Not my intention. However, if there was a extension to address both that would be optimal. I think it is possible to create a fluid private discussion that works well between just two people. Yes, private discussions can do more; but it would be quite difficult to make them as simple as a private messaging system (from the end user's point of view) for the simple reason that you have to take into account things like tags and permissions. With a private messaging system, there's no need for either. The problem here is by solving it top-down or bottom-up. Should discussions be specialized by existing code to satisfy this or create a whole new system just for this? I'm more divided now. I think most of your objections are on user interface on esotalk. Here. I created what I think the private discussion menu should look like (including tags, like I said, I don't think permissions should apply in private discussions. Kulga I think it is possible to create a fluid private discussion that works well between just two people. Sure, but that's sort of missing the point I was trying to make. I don't think "private messaging" is necessarily limited to one-on-one conversation. I've used forum scripts that allow you to invite any number of people to participate in a private conversation. The difference lies in the relationship between the private content and the non-private content. A private discussion is simply a discussion that is restricted to specific people. Beyond that, it will behave just like other discussions: it will take tags just like any discussion, and it will appear in the list views for those tags together with other (non-private) discussions. Private message style conversations, by contrast, won't be tagged and will never appear in the same list as other non-private content. They get a UI all of their own, which segregates them from the rest of the content. Kulga The problem here is by solving it top-down or bottom-up. Should discussions be specialized by existing code to satisfy this or create a whole new system just for this? Yes, that's the thing. The private conversations in esoTalk were (I believe, and @Toby can correct me if I'm wrong) built as a simple way to support private communication by leveraging the existing conversation functionality. That's why you can't invite someone to a private conversation in a channel that they can't see. To get around that issue, you'd have to adjust many aspects of how conversations work. And if you're going to do that much work, well, why not just go all the way and give private communications their own space (i.e., build a segregated private messaging style interface)? Kulga I think most of your objections are on user interface on esotalk. 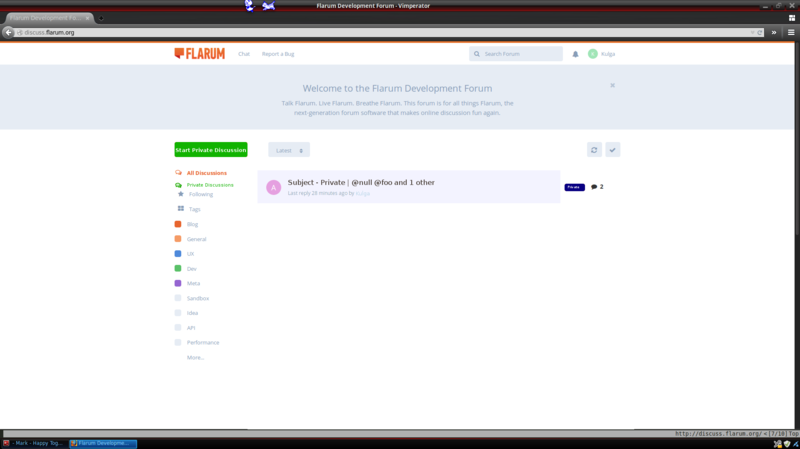 I do see see some limitations in how esoTalk does private conversations, and I believe Flarum will be able to do better. I've got ideas about how that system could be improved. But I'd also like to see an extension that provides a more segregated way of handling private conversations. I think such an extension would be very useful in certain situations. I don't think we'll support tagging private discussions to start with, but maybe later (and it'll definitely be optional, unlike in esoTalk). Toby I don't think we'll support tagging private discussions to start with, but maybe later (and it'll definitely be optional, unlike in esoTalk). So private discussions won't be segregated from other content, but won't need to be tagged? Sounds good ... but how do you prevent people from tagging their private discussions? EDIT: Hmmm ... I just noticed the "Start Private Discussion" button on the second mockup by Kulga and that gives me a clue as to how it might be done. Basically private discussions are handled by an entirely separate routine, which automatically assigns a "Private" tag (or some flag or something equivalent to it) and doesn't offer the opportunity to choose any other tags. Am I warm?